Home / Blog / Death in Sarajevo and the pride before the fall. Death in Sarajevo and the pride before the fall. With the anniversary of the first world war commerated later this year, no little information on the subject is becoming available across the media. For instance, and not least, how it all started. Well, there are numerous reasons and factors involved, so here, in a single article, it is probably best to focus solely on the one single event that took place on June 28th 1914, which would act as the physical trigger for the conflict. 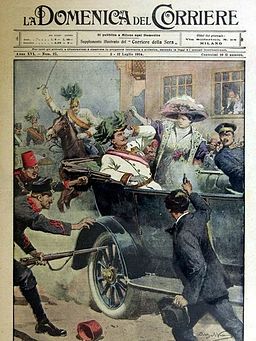 The event in question is the assassination in Sarajevo, Bosnia, of the heir to the Austrian throne, Archduke Franz Ferdinand, by the Serbian terrorist group the “Black Hand”. A nationalist group sworn to end Austrian rule in Bosnia and Serbia, they succeeded through a combination of bad luck and bad judgement. The Archduke had, before he even arrived in the city, been warned about the threat of an attack, but decided to ignore this advice. He also chose to alter the route he took when being driven through the city that day, following an earlier attack. This decision was not a tactical one, but rather one taken on the Archduke’s command in order to visit several entourage officers injured in this first assault. The change of travel plan caused the driver to become lost and as ill luck would have it, the car ended up stopping opposite Gavrillo Princip, a member of the Black Hand. Seeing his chance, the terrorist pulled a revolver and shot both the archduke and his wife as they sat in the open-top car. The political ramifications were inevitable and immediate. Austria blamed Serbia on the basis that they must have supplied the Black Hand terrorists with their weapons. This could not be proved and Serbia angrily called on its Slavic allies in Russia for support. In turn, Austria asked Germany for support should Russia decide to mobilise its forces. Germany saw the need to defend its ally and reasoned a swift retaliatory action against Serbia would break German encirclement in Europe and settle with Serbian nationalism once and for all. Germany and Austria sent an ultimatum to Serbia, requiring a reply within 48 hours, demanding they crush the Black Hand and permit an international investigation of the assassination. This would have been greatly embarrassing for Serbia and inevitably they refused. From this point on, the actual act of the murder seems almost obosolete. Communications between all the various nations involved were numerous but they crossed each other and confusion reigned, causing fear, anger and indecision, most particularly in the case of Russia’s Tsar, Nicholas. Timetables of agreement and resolution were missed and the crisis escalated inexorably towards its fateful conclusion, where Germany declared war on August 1st. Similar confusions and assumptions of neutrality soon followed when Germany asked France to remain neutral and Britain not mind the occupation of Belgium. Instead of standing back as expected, both countries joined the conflict, and the Great War had begun.